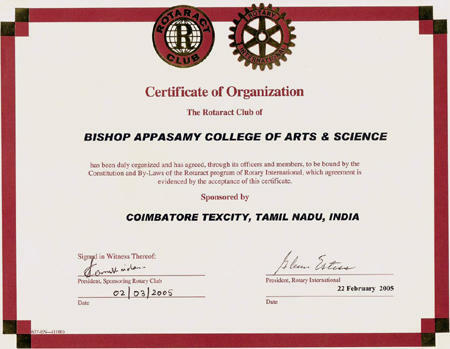 OUR CLUB, ROTARACT CLUB OF BISHOP APPASAMY COLLEGE OF ARTS & SCIENCE WAS CHARTERED ON 22nd FEBRUARY 2005. Rtr.ABHISHEK BAJAJ IS THE CHARTER PRESIDENT OF OUR CLUB. Rtn.PHF.RAMESH NICHANI WAS THE THEN PARENT ROTARY PRESIDENT. WITHIN A VERY SHORT TERM THE CLUB GAINED VERY GOOD HEIGHTS IN THE DISTRICT.